Newspaper crafts are popular for both kids and adults! Newspaper is cheap, readily available and an accessible medium to use. Also, newspaper crafts are environmentally friendly. Many people like to recycle paper rather than throw it away into a landfill. 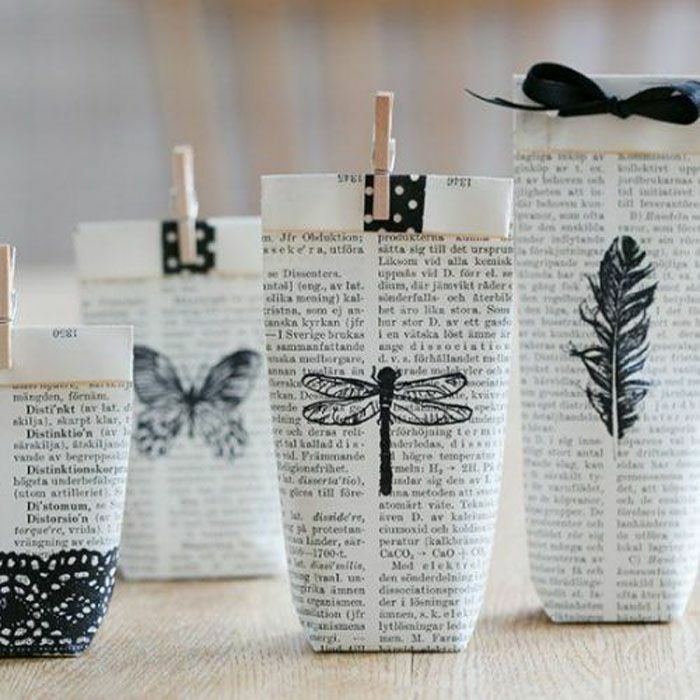 Newspaper crafting is perfect for those that love to make things and are passionate about eco-friendly practices. Most people associate paper mache with newspaper crafting, but you can make much more from recycled papers. It's possible to create wall decor, furniture and even clothing from newspapers. We've rounded up our favorite crafts constructed from recycled newspaper that will just amaze you. This colorful craft is great for kids! Celebrate the spring season or an ordinary weekend afternoon with a little newspaper and watercolor paints to create these beautifully layered flowers. Buy a premade paper mache or wood block letter from your local craft store. Transform it into beautiful wall decor with newspaper, black paint and decoupage medium. Add some decorative elements and a nameplate to the design for a decorative initial that perfect for a kid's or teen's room. Faux food from paper mache is so much fun to make. This turkey in the roasting pan looks almost real enough to eat. Faux food is also great for use as props in theater productions! It is possible to make clothing from old newspapers! Just substitute newspaper for fabric and you will end up with a most unusual outfit. The dress in the photo takes about 8 hours to construct and looks so cute! Make it for Halloween or for a special party occasion. This homemade newspaper toss bouquet is perfect for the bride that's looking to get creative and save a bit of money on her wedding. The floral paper toss is made from one or two Sunday papers. Add new life to an old or plain lantern. Merely decoupage small newspaper pieces onto the lantern for an instant upgrade. Give your living and dining rooms a newspaper decor upgrade. It costs almost nothing to revamp these areas. Cover some lanterns, and add a newspaper tablecloth for instant fun and avant-garde design in your home decor. Why pay for expensive peat moss pots for your spring seedlings when newspaper works just as well? When you are ready for planting, merely place the entire newspaper pot seedling into the ground. The newspaper will decompose with time and not harm your seedlings whatsoever. Make a purse from rolled newspaper strips. This bag is fun and artsy, perfect for those that like their apparel to be unique and one of a kind. Never be without an envelope again! Simply fold newspaper into an envelope and add a brown kraft paper liner. These adorable stamped bags are created from book pages, but there is no reason you couldn't use newspaper. Add a black stamp, washi tape and a clothespin to your bag to add some beauty and pizzazz. Young children will love this craft project. A sheet of newspaper is scanned and then printed onto computer paper. A fox outline is drawn with a black marker and is then filled in with paint. The newsprint peaks through the face. We think this project is just adorable, and perfect for use in the classroom. It's fantastic how professionally made this lamp looks. It's simply made from rolled newspaper strips cut at various lengths and attached to a lamp fixture with glue. We think this light would be fabulous painted white with a high gloss varnish. You would never know that the lamp is made from newspaper! Lee Kyu-Hak is a Korean artist who specializes in recreating famous paintings using wood blocks wrapped with colored newspapers. The example above is a recreation of Van Gogh's famous painting Sunflowers. Why not take some inspiration from Lee Kyu-Hak and make some newspaper art recreations of your own? Are your kids complaining that they are bored? Make some memories with newspaper. Build an impressive fort for your kids from paper and then they can enjoy hours of fun using their imaginations. What a thrifty, delightful craft project! Do you have a space on your wall that needs a mirror but no money to buy a high priced piece from your home goods store? Newspaper to the rescue! Paint, roll and hot glue newspaper coils in an artistic fashion around an inexpensive circular mirror. It makes a cute and fun addition to your wall decor. Let's go old school with this craft! Almost everyone remembers making newspaper hats as a kid. This is a paper craft that never gets old! Can you believe it's possible to make furniture from shredded newspaper? Students Peter Plantan and Nusa Zupanc have proven it is possible. They designed this paper chair using finely shredded newspaper and recycled foam board held together with a glue made from flour and water. You can make one for yourself following the directions here. This lovely end table is another example of functional furniture. The newspaper also doubles as a design element and the wood pieces come from recycled fruit crates! This DIY is a recycler's dream! The crafting possibilities with newspaper never end! Make some DIY Roman Blinds from rolled newspaper strips. They look fabulous just like that, but you could paint them a reddish brown color to imitate bamboo. Add a high gloss finish over the paint, and people will never suspect your blinds are made from newspaper. Make a newspaper polar bear wall hanging or card. So cute and so easy to make. Moms and their kids will have fun crafting this adorable newsprint bear together. We just love this bracelet made from newspaper beads. Add some sparkly glass beads to finish the bracelet and get ready to receive some compliments! Everyone will love your one of a kind handmade jewelry item. This is not your ordinary paper mache bowl. It is a work of art you will be proud to display in your home. Make a regular paper mache bowl, then spray paint it gold on the inside and black on the outside. Use a white oil based marker to draw a floral pattern on the outside of the bowl. So simple and so beautiful! Sometimes you just need to make a paper mache cupcake sculpture. Learn how to make a giant sized paper cupcake using cardboard, newspapers and pool noodles. Make a map of the world from newspaper and decoupage it on a wall. The finished project looks quite elegant. Newspaper strips weave together to form a basket in this project. Make several for Easter and fill them with Easter grass, eggs and candies.